I should really be super organised and create my cards way back when I come up with the colour combos, as I had so many ideas when I did, but when it came to making my card recently I couldn't think of what to do! 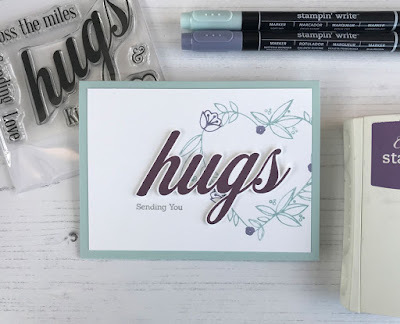 I love the boldness of this hugs sentiment from BIG & BOLD Hugs and I really should do more bold focal sentiment stamps ;) This time I decided to pair it with the heart wreath from Originally Organic Additions and a smaller 'Sending You' sentiment from Simply Said II. As I don't have the SU! inks for Soft Sky and Wisteria Wonder I used my SU! Markers and MISTI tool to ink the stamp and repeatedly stamp it using the MISIT until I had a image I was happy with! 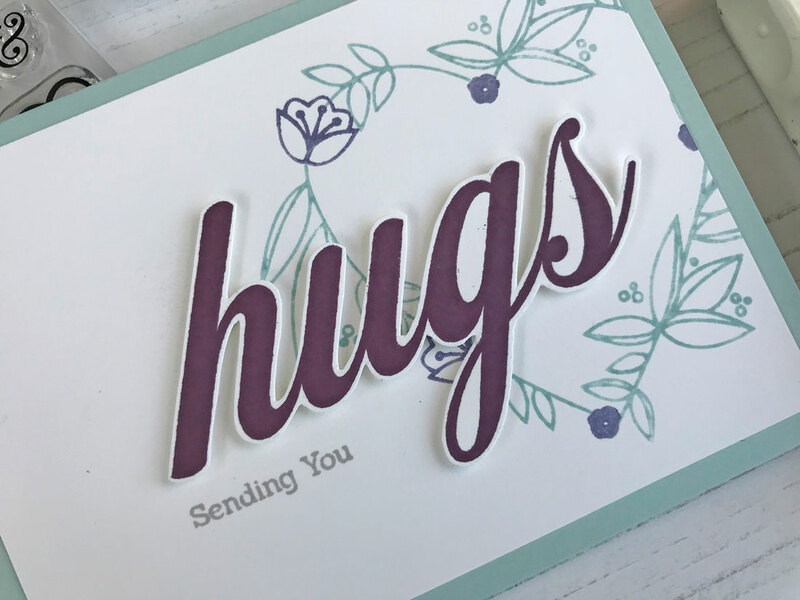 The hugs sentiment is stamped in Perfect Plum, fussy cut out and adhered to the card using foam adhesive. Short an sweet today from me, I've not much time before one Bean goes to nursery and on stays home with me! No rest for this mummy today or tomorrow and I've a HUGE list of things I need to do as well as keeping him busy. Nothing like multitasking at its best! 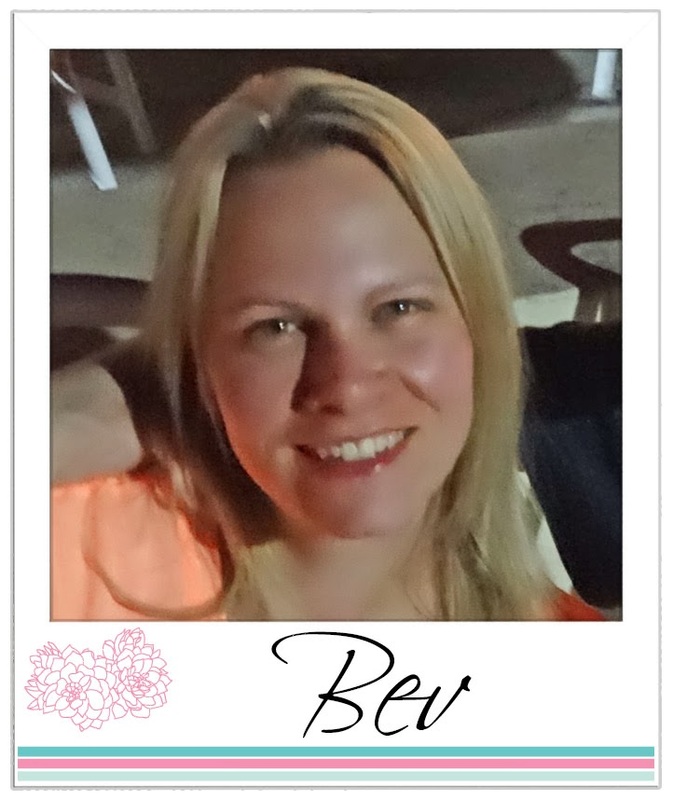 Absolutely beautiful, Bev! Your friend will love receiving this thoughtful, stylish Hugs card! Once again, so impressed with your design AND your skills at fussy cutting! 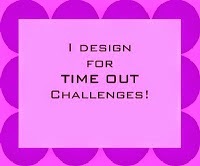 Oh I'm glad I'm not the only one who forgets what I had in mind when creating challenges, lol!! Your card is beautiful! Love the big bold sentiment! The heart behind in the soft shades is the perfect touch. Inspiring, as always! I adore your lovely floral heart and the bold hugs! 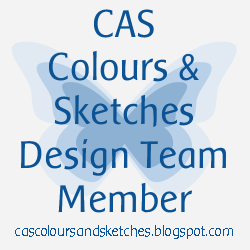 It's really an elegant & CAS card! By the way, I don't have any close colors to whisteria and plum. I've tried many ways to color my balloon, then I decided to buy more Copic markers to finish it! Beautiful card, Beverley, lovely layout and use of the colours. 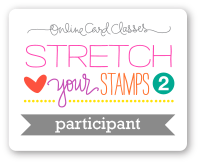 Love your card design, Beverly! The heart wreath stamped off the side of the paper and the way you used that bold sentiment, is just gorgeous and so visually appealing! Gorgeous I love the font of the hugs sentiment! Sweet card Bev. 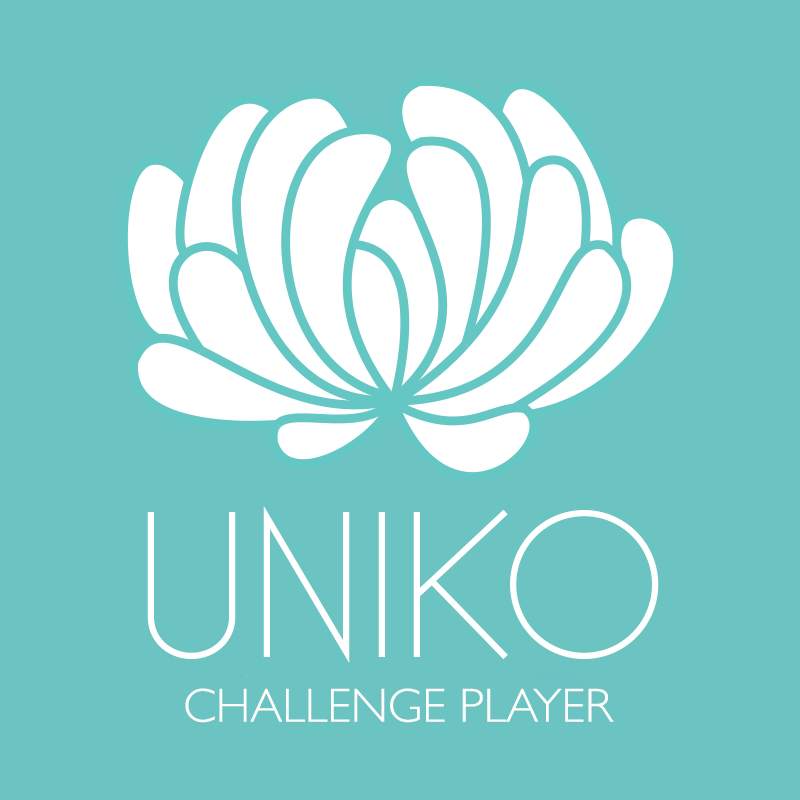 I love the delicate floral wreath - so pretty.